Turn a galaxy into your very own puppet government! Even though I don't play very many of them, I am delighted that "hyper complex space sims," as a genre, exist. There is a dedicated fan base out there who will definitely invest in a product like Masters of Orion, but games of this nature don't necessarily penetrate the market. The only explanation for the genre's existence is that these games are labors of love designed by people because they, themselves, wanted to play this exact game. That brings us to Drox Operative ($19.99), and its recent expansion Invasion of the Ancients ($9.99). If I was forced to classify this game into any genre, I would reluctantly pigeonhole it into the aforementioned "hyper complex space sim," because it is complex, and it is kind of a simulation, and the game plays out in space. It does, however, combine elements from across genres. 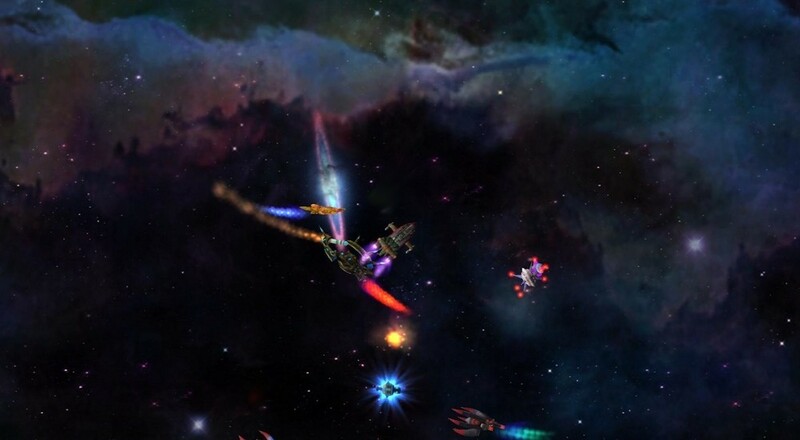 Catching a glance of the product in action might make you think it's a straight up space action game. Keep watching, and you'll think its something like an RPG. A little more, and you'll think Drox is some weird Civilization mod. If you see a game played from beginning to end, you'll realize all of these systems are working in tandem to create a strangely unique experience. You and up to three buddies take control of the titular Drox Operatives, who soar around a randomly generated sector solving everybody's problems. Or, if you want, you can create problems for some poor schmucks out there. The story is really more of a premise. You are an operative working for the Drox Guild, a shadowy organization that dispatches agents to sectors in space to help out those factions who will benefit the guild. The real narrative is the one you create for yourselves. I don't really care about the Drox Guild, per se, but I've got fond memories of fighting a losing battle against our Dryad nemeses, only for our allies the Fringe to pour in from a wormhole and turn the tide. Playing Drox Operative is easy. Fly around and blast enemies. That in itself is not hard. Point and click just like you would in Diablo. The complexity raises its head when you realize the game is not all about flying around the final frontier and gunning down anyone who looks like a jerk. The randomly generated galaxies of Drox Operative are living things with their own stories to tell. The clockwork-like systems in the game are obfuscated, and require a time investment to grasp. I've completed a game and I won't pretend to be a Drox expert. Reducing bandits to interstellar debris is simple. Bringing stability to a sector at war is where it gets complicated. Before starting your journey, you have to make your ship. Pick a faction from any of the 11 in game races, determining your appearance, skill advantages, and additional equipment slots. For my first game, I chose a human ship, which comes with an extra slot for mines, bonuses to Computers and Tactical, as well as a permanent slot for a human crewmember. While the USS Porkchop enjoyed several brushes with glory, my heart bonded with my second ship, the Meat Man, and its Drakk pilot Godak. Having a dedicated slot for a hangar bay meant I would never need to sacrifice another equipment slot to have fighters wastin' fools so I didn't have to. New operatives start out with just the one crew member, but may recruit or rescue more in their journey through space. Crew members provide bonuses to your ship's stats, and can level up as well.